Tower Manufacturing’s User Replaceable GFCIs allow for adding or replacing GFCI’s to existing cords and equipment. GFCI’s are available in 15 and 20 Amp and include grommets to allow easy wiring for various cord sizes. The products are offered in two colors – black or yellow for high visibility applications such as construction or maintenance. Tower offers models in both automatic and manual reset. 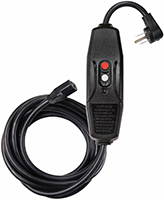 An automatic reset turns back on upon being plugged in or after a power interruption. A manual reset requires the user to press the reset button after initial plug-in or after a power failure. Both automatic and manual reset GFCI types must be manually reset after a ground fault occurrence. Includes 14/3 gauge SJTW cord, 10 ft.